Huddersfield Town Association Football Club is a professional football club based in the town of Huddersfield, West Yorkshire, England. The club now competes in the Premier League, having been promoted by winning the 2017 Championship play-off final. 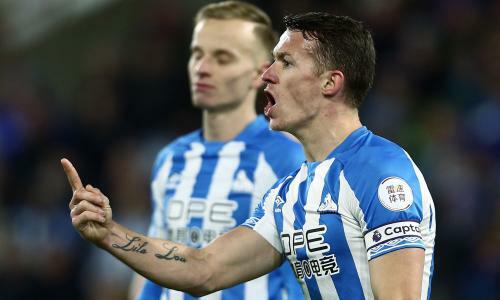 In 1926, Huddersfield became the first English club to win three successive league titles, a feat which only three other clubs have matched, and none have bettered. The first two league titles were won under their manager Herbert Chapman, who also led the club to the FA Cup in 1922. In the late 1950s the club was managed by Bill Shankly and the team featured Denis Law and Ray Wilson. After two seasons in the top division in the early 1970s the club spent 45 years in the second, third and fourth tiers of English football before being promoted to the Premier League in 2017 under their manager David Wagner. Nicknamed The Terriers, the club plays in blue and white vertically striped shirts and white shorts. They have played home games at the Kirklees Stadium since 1994. The stadium replaced Leeds Road, Huddersfield Town's home since 1908. Where has this crap about lossl getting a new deal if he plays 1 more game come from? Only signed permanent deal last summer. Or was it a 34 game contract. Was it chuff! Lossl one more game he plays...trigger on other year contract...but said he wants to leave...so...why play him..
👀 Defender Jaden Brown drove past two players and slotted the ball into the bottom left corner with his right foot. 🗣️ "I am still learning because I have a long-term view. “I still have the possibility to learn about the players. I can’t waste time in the last four games." Jan Siewert preparing for next season. We need to start with grant and mounie for last few games ,if they both staying and get em to work together more to form some kind of partnership,if mooy is off let's have Danny Williams have a run out. Not won me over yet but can't just blame him when players themselves have given up. I think you will be good at town jan but aren’t the training sessions for learning about your team not match day? Still learning? Doesn't take a genius to drop Hamer and put Mooy and Pritchard on at the start. Not rocket science. Collectively not PL standard. 14 points should tell him that. Havenotgotaclue.com. Has he not gone yet? Tantamount to an admission he does not have a clue. He really needs to show massive improvements...best side out all the time..apart from injuries...if he pisses about every week..we will struggle in championship. .badly...out of managers league..can't play players that he's playing out of position..future not bright. 🎟️ Tickets for Town's upcoming Premier League game at Southampton FC are now on sale to supporters with 1 point and over. Amazing. You pissed people off by putting the tickets to a ballot after 325 points against Spurs. Why didn't you do the same with this one?